If you are looking and having trouble finding where to put a jumper if the touchscreen pin connector is already gone or lifted due to water water damaged on Nokia Lumia 820. This solution might help you to ease out your hard time finding where to solder a jumper wire on it just to fix a touchscreen not working problem. 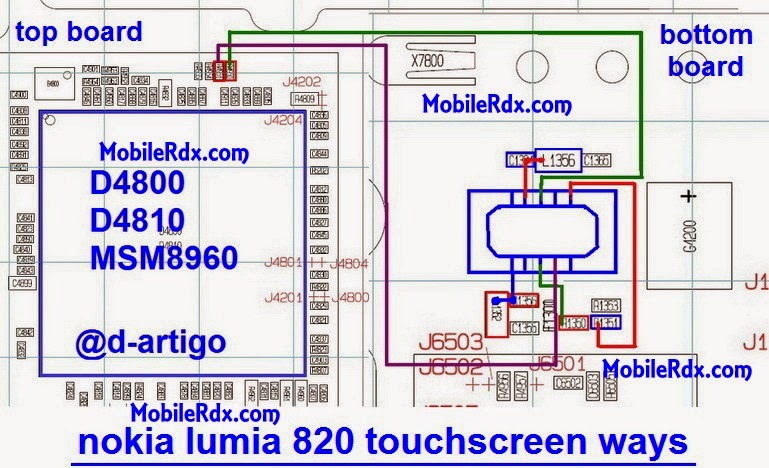 This solution exactly shows the connection line paths of the touchscreen pin connector of the Nokia 800 PCB board layout. You may only need to check its corresponding pinouts if the connection were already cut-off or have an open circuit, then solder a jumper on it, for it is only the options. Jut also check out all the corresponding components where the particular pins is connected for it will also cause the problem if already damaged or corroded.